I’m sharing my method for the most unbelievably juicy grilled pork tenderloin, which cooks in under 15 minutes. Pair with grilled vegetables for a filling and healthy dinner! Let’s keep this grilling train rollin‘, shall we? Here at home we have the capability to grill year round, but the desire to stand outside freezing my buns off in the season that shall not be named is, shall we say, lacking. That said, I welcome grilling season – what with it’s sizzling suppers requiring nearly no cleanup – with open arms, and a cold drink in hand. seasonings: salt, pepper, garlic powder, steak rub, etc. Heat grill on high until it reaches 500 degrees then turn one burner down to low. Rub pork tenderloin all over with extra virgin olive oil then season with desired seasonings. Add pork to the high heat side of the grill then grill for 1-1/2 minutes on all four sides, keeping the lid closed between flipping. Move pork tenderloin to the side of the grill with low heat then grill for an additional 4 minutes on each of the two larger sides (so 8 minutes total,) or until an instant read thermometer reads 140 degrees, keeping the lid closed between flipping. Let pork rest for 10 minutes before slicing and serving. I don't recommend marinating the pork in anything containing sugars (honey, brown sugar, maple syrup, etc) as it will likely burn while searing the outside of the pork. 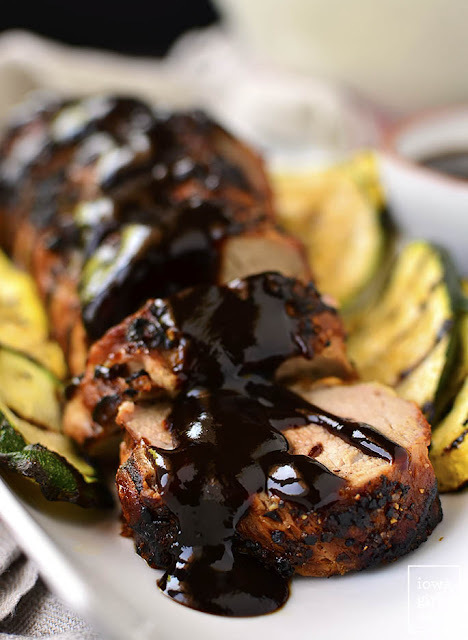 I like to serve my grilled pork tenderloin with my Honey-Balsamic BBQ Sauce or homemade Chimichurri Sauce. 0 Response to "(Unbelievably Juicy!) Grilled Pork Tenderloin"